If you thought that at twenty minutes long that Yardmaster was too long a game, then there is a solution. 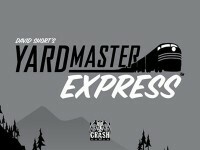 Funded through Kickstarter and also published by Crash Games, Yardmaster Express is a micro game that can be played in ten minutes however many players you have. Designed for between two and five players, aged thirteen plus, in Yardmaster Express, the players attempt to build the most valuable train in a limited number of turns. The game consists of one Start Player token, five Engine cards, thirty-two Railcar cards, and four Caboose cards. 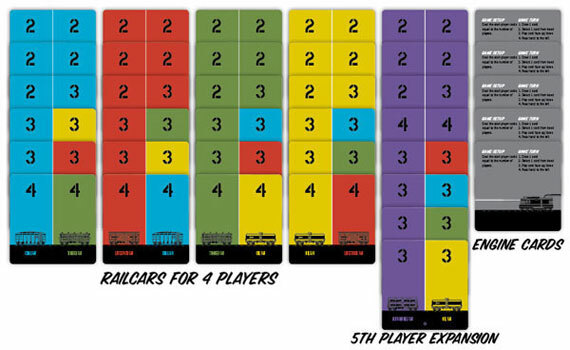 At the start of the game, each player receives an Engine card to which he will attach his Railcar cards and one player is given the Start Player token. This player draws a hand of Railcar cards equal to the number of players. He then takes his turn. On his turn, a player draws one Railcar card and adds it to his hand. He then plays one card from his hand. Each Railcar card is two-and-a-half inches square and divided vertically in half. Each half of the Railcar card has a colour and a number on it as well as a railcar. Both the colour and the number on each side can be the same or they can be completely different. What matters is that when added to a player’s train, the colour or the number of the new Railcar must match the colour or the number of the last Railcar in the train. So for example, the last Railcar in Dave’s is a Green 2. Thus he can play either another Green card or any card with a value of 2. If a player lacks a card that he can add to his train, then he flip a card and play it as a Wild Card, in which it acts as any colour or number. At the end of his turn, a player collects up his hand and passes it to the player on his left, who then takes his turn. Once a set number of round have passed—seven for two players, six for three players, and so on, then the game ends. The players add up the value of the numbers on the railcars in his train—that is, both numbers on each Railcar cards—to get a total. The player with the longest run of one colour of railcars receives a bonus equal to their number. The player with the highest total is the winner. Now what is clear here is there is only the one hand of Railcar cards. It is this that is passed from one player to next, each time the holding player drawing and playing a Railcar card. The draw, play, and pass mechanic feels not dissimilar to that of 7 Wonders, though of course, there is only the one hand of cards whereas everyone has a hand of cards in 7 Wonders. The same two core choices are offered here as in 7 Wonders—does a player add a Railcar to his train because he needs it, or because it will prevent another player from adding a Railcar that he needs? This choice may not always be there, but it needs to be kept in mind when it is. The game though, is primary luck based, players relying on drawing the Railcar cards that they want to play rather than on cards that they want to prevent another player using..
Yardmaster Express is nicely presented. The cards are of a high quality and a nice touch is the basic rules are printed on the Engine cards for easy reference. The rules are easy to read and learn. The packaging is nicely sturdy. The addition of the wooden Start Player token is nice too as is a mini-expansion and some variant rules. Given the lack choices and actions—just draw a card, play a card, pass the cards on—Yardmaster Express is suited to a younger audience, rather than the suggested minimum age of thirteen which feels rather high. It also plays better with three or four players as with five players, the number of turns feels far too short. Yet despite its simplicity, Yardmaster Express is reasonable filler, one that fits easily into a bag and carried around. Forget the 13+ age rating. Can your kids play UNO? Good. Then they can and should try Yardmaster Express. There is only one hand of cards that players share, and turns are lightning fast. Draw a card, play a card, pass the hand. The card-play is reminiscent of UNO, if UNO weren’t tediously long. Each card has two train cars on it. You must match either the color or number to the previous car in your personal train. You may instead choose to flip a card over and use its wild side, though this garners fewer points and may break up a valuable color streak. The drafting mechanic really allows this game to shine. First, it is the simplest possible introduction to drafting; with only one small hand of cards, passing hands never gets confusing, even with the youngest players. Second, the drafting mechanic provides some take-that action (like UNO) without shoving anyone out of the game (I.e. Skip cards and Draw 4s). Scoring is simple addition with some fun bonuses if you use the optional caboose cards. This game is so short and sweet, perfect for waiting rooms anddelays, it belongs in every mom’s purse or dad’s coat pocket. When you first get Yardmaster Express, you get to marvel a moment at the packaging. The outer-sleeve for the box is slick and glossy and is a tight fit for the game box it is protecting. Once you slide the outer-sleeve off, it reveals a game box with a magnetic clasp that opens to reveal the components. I have the Kickstarter version, so your contents may be a bit different. You’ll see a deck of cards wrapped in plastic, a wooden first player token, a cloth bag with the game logo, the rules, and a caboose expansion which is a small set of cards that is also plastic wrapped. All of this fits into what is essentially a double-sized card box and it is well laid out and considered. The component level is surprisingly high. The game itself is very simple and very fast to play. It can handle up to 4 players, but it might be best with two. Anyhow, a shared hand is dealt, with one card for each player in the game. The active player then draws a card – so in a two-player game, there would now be three cards. You choose a card and attach it to the end of your train. Attaching the train is where the rules get as complex as they will be. You can attach a card if it has the same color or the same number. If none of the cards meet that criteria, you can flip the card over to turn it in the a low-point value wild card. Once you have played a card, you are done and you pass the remaining cards to the next player. Play continues until a set number of cards are on the table (7 in a 2 player game, 6 in a 3 player game, and finally 5 cards in a 4 player game). Scoring is pretty easy – just add up all the numbers on the cards. Whomever got the longest run of unbroken colors adds the length of the run to their score – and this is often the difference maker. The play time can be under 10 minutes once everyone knows the rules. As you add players, you add time. To me, the game feels a bit more random with 4 players since so many cards are taken by the time it returns to you. It also takes longer to play a game with more players. Two or three players seems to be the sweet spot. There is a bit of room for gamers to make some choices, but towards the end you will often find yourself wishing for a lucky card draw. Knowing when to flip a card and set yourself up for connecting any card is probably the biggest choice to make in the course of a game. If you want a super light-weight fast playing filler game, Yardmaster Express is quick and easy. Add a Review for "Yardmaster Express"